Defend the deep! A cry for help from the sun's interior leads the characters to dive in again. Forces loyal to efreet from the Plane of Fire have conquered the deep-sun settlement of a peaceful alien species and threaten to destroy their way of life before it can be understood. The heroes must infiltrate the occupied city, make first contact with allies within, and defeat the fiery oppressors. As a strike team, the heroes take out high-value targets and restore the proper order. Mission accomplished, the heroes learn that this efreet attack is merely a beachhead for an invasion that could threaten the sun and the Pact Worlds! 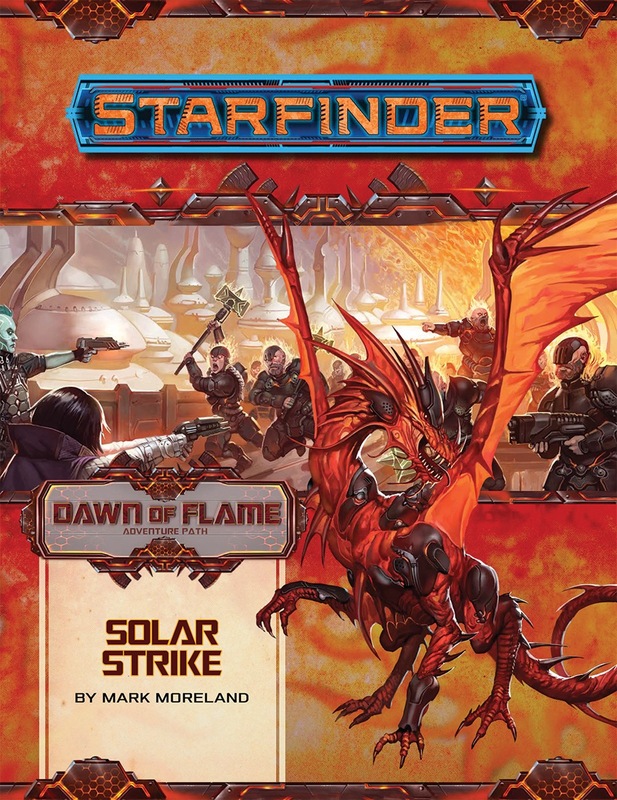 "Solar Strike" is a Starfinder Roleplaying Game adventure for four 9th-level characters. This adventure continues the Dawn of Flame Adventure Path, a six-part, monthly campaign in which the players uncover a plot that threatens the Pact Worlds sun. It also includes a gazetteer of Kahlannal, an inhabited bubble-city deep inside the sun, an article on the cultures extant in the sun and other stars in the galaxy, and a selection of new monsters with solar or elemental origins. 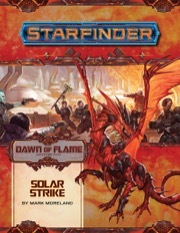 Note: This product is part of the Starfinder Adventure Path Subscription. Announced for June! Product image and description are not final and are subject to change. preventing a foothold situation from invaders from the plane of fire feels like an expendables plot-consider me excited!